New Delhi : History has bookmarked the date 26 Feb 2019 as Indian Air Force has crossed the Line of Control (LoC) early on Tuesday morning and destroyed terror camps of Pakistan-based Jaish-e-Mohammed in Balakot. Twelve Indian Force Mirage-2000 jets have gone for surgical Air Strike, two weeks after a worst terror attack on CRPF soldiers in Pulwama, Jammu and Kashmir. 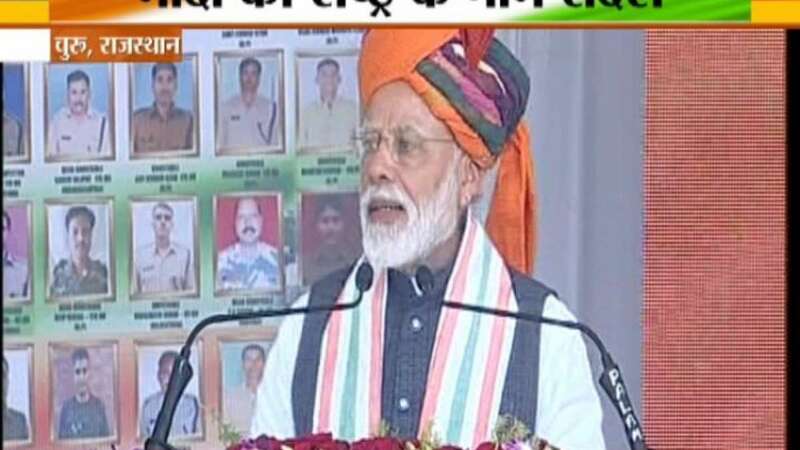 In a public gathering in Churu, Rajasthan, Prime Minister Narendra Mod said, “Today I assure the countrymen, India is in safe hands.” He also repeated the BJP’s campaign slogan of 2014 with the message that he won’t let anyone hurt or stop the nation. In his first public comments after the air strikes in Pakistan, Prime Minister Narendra Modi Tuesday said the country is in safe hands and that he will not let the country down. The prime minister stressed that nothing was above the nation. "Today is a day to pay homage to India's bravehearts. I want to assure you that the country is in safe hands," he said at a public rally here. "I vow that I will not let the country bow down," he said. In a swift and precise air strike following the Pulwama Attack, India bombed and destroyed Jaish-e-Mohammed's biggest training camp in Pakistan early Tuesday, killing a "very large number" of terrorists, trainers and senior commanders. The operation, described as a non-military, preemptive strike, was welcomed by the entire political spectrum and military experts who had been advocating retribution after the February 14 suicide attack on a CRPF convoy in Pulwama claimed by JeM. Ammunition dump blown up today in Balakot,Pakistan by IAF Mirages. The dump had more than 200 AK rifles, uncountable rounds hand grenades, explosives and detonators, quoted sources. PM Modi also said that more than 20 lakh Army jawans have been given OROP. "Nothing is more important than the nation," he says.